Page 2 – Just delicious food. Simple. Some of you have asked me if I quit posting after just starting…No worries I am still here, ready to cook and post. The reason for not posting: I have been on a fabulous family holiday to various destinations in Asia. We started in Singapore, followed by Vietnam and then to Thailand, Bangkok and Koh Samui. I have seen so many great things and took thousands of photos, but this is not a travel blog, it is all about food. And yes, we had the most delicious food in all of the places. 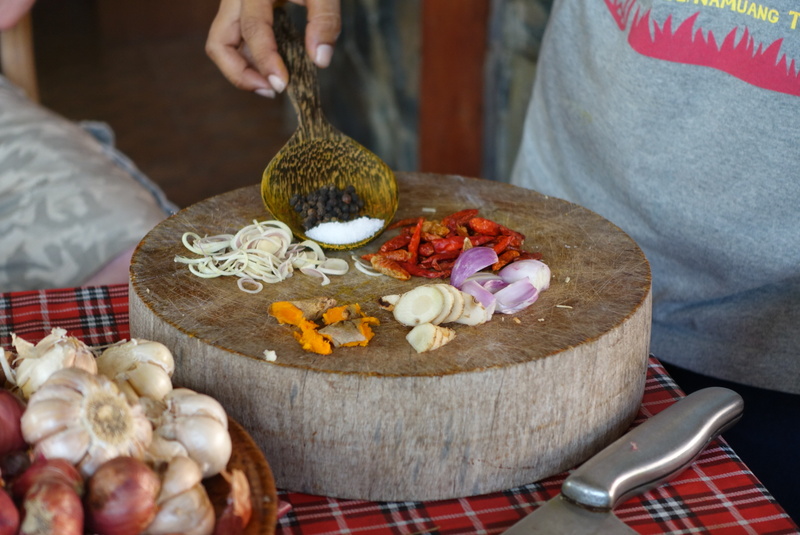 While being in Koh Samui we did a tour around the island with a guide and at the very end she showed us how to make authentic red Thai curry paste. 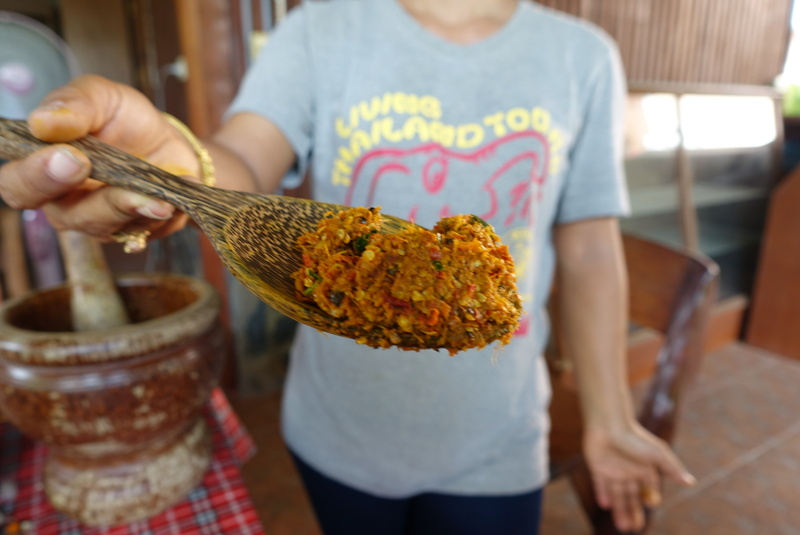 There are plenty of different recipes for curry paste, each family has their own. I took some photos while she was making the paste and this is the recipe I will share with you. Put all ingredients into a mortar and start pounding with the pestle until you have a fine paste. 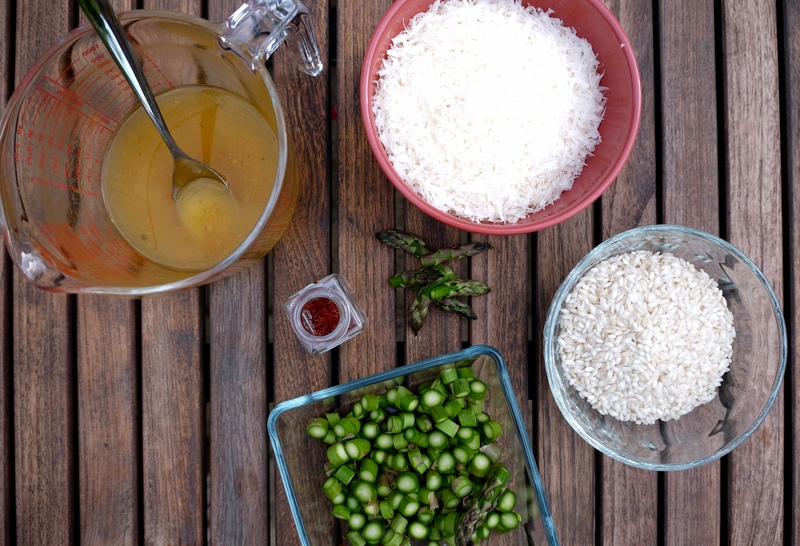 You can use this paste now to make your Thai red curry. Heat some oil in a pot add 1 tbsp of the paste and fry for 1-2 minutes. Stir in 1 can of coconut milk and bring to a simmer. Cut 4 boneless, skinless chicken breasts into pieces, add into the sauce and simmer for 5-7 minutes or until fully cooked. 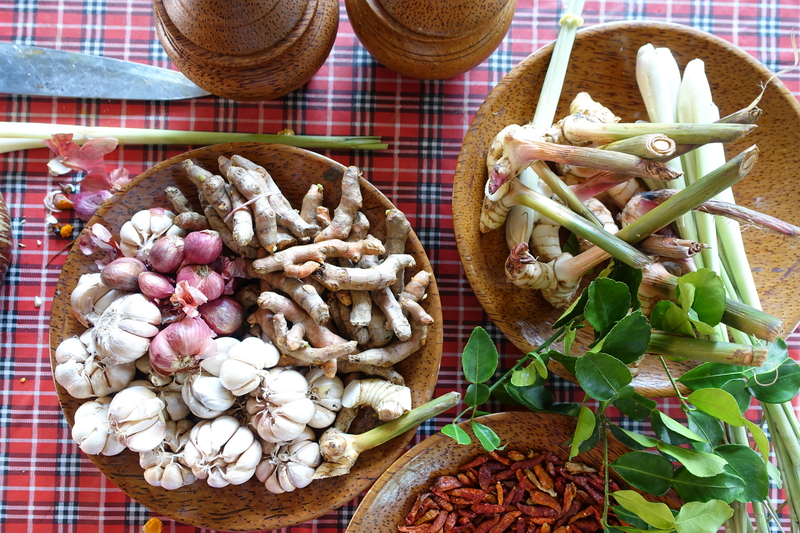 Season with salt, or even better with fish sauce, and a bit of sugar. Serve with steamed rice. You can freeze the leftover paste for up to 2 months. 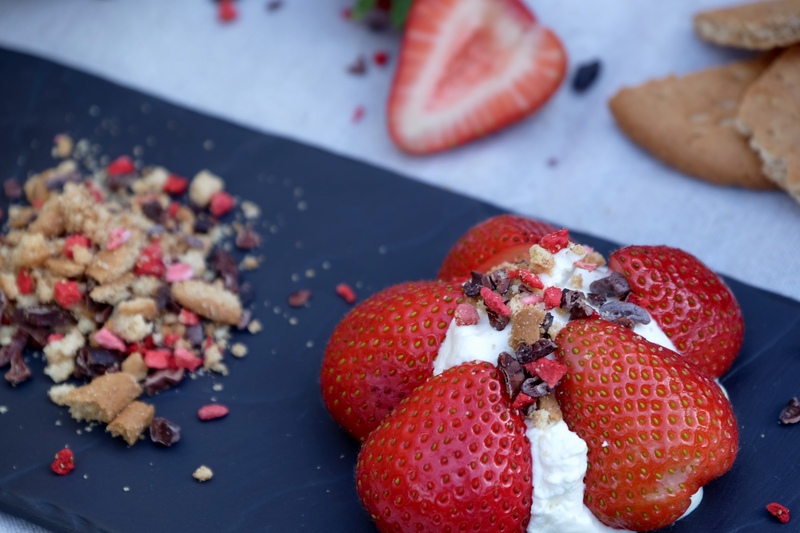 You might wonder why I am posting so many recipes with strawberries……Very simple answer I just love them. 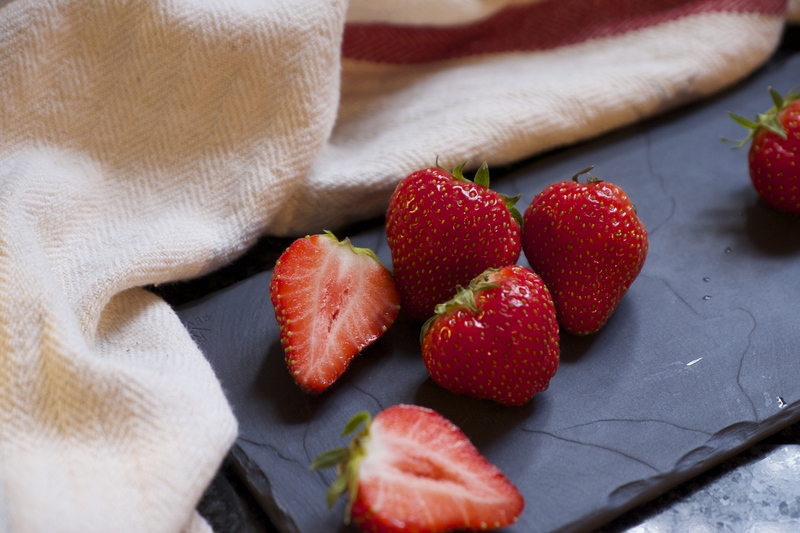 The few months during summer when strawberries are dark red, bursting with flavour and spreading a heavenly aroma, I can’t get enough of them! One of my store cupboard ingredients is feta cheese, I always have at least three or five in my fridge. They are very versatile to use, either cold crumbled over salad, baked in the oven with vegetables or made into a dip or dressing. 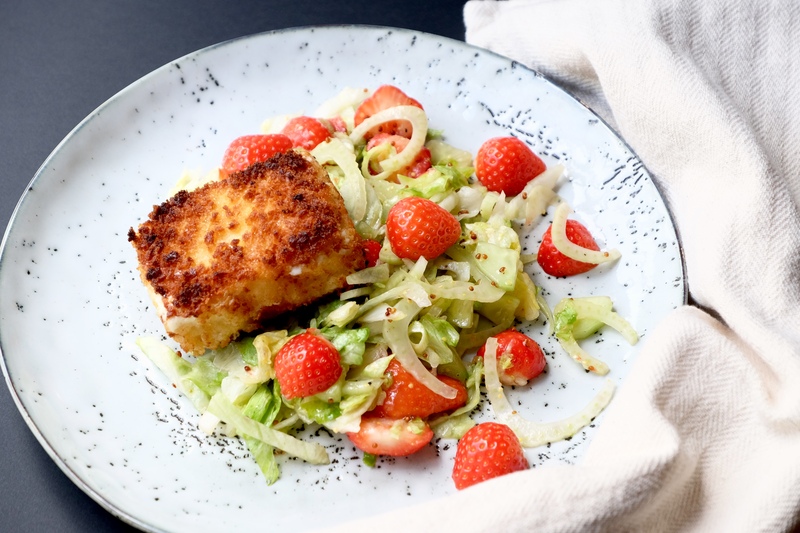 So it was easy to go for crispy feta cheese to accompany my strawberry summer salad. 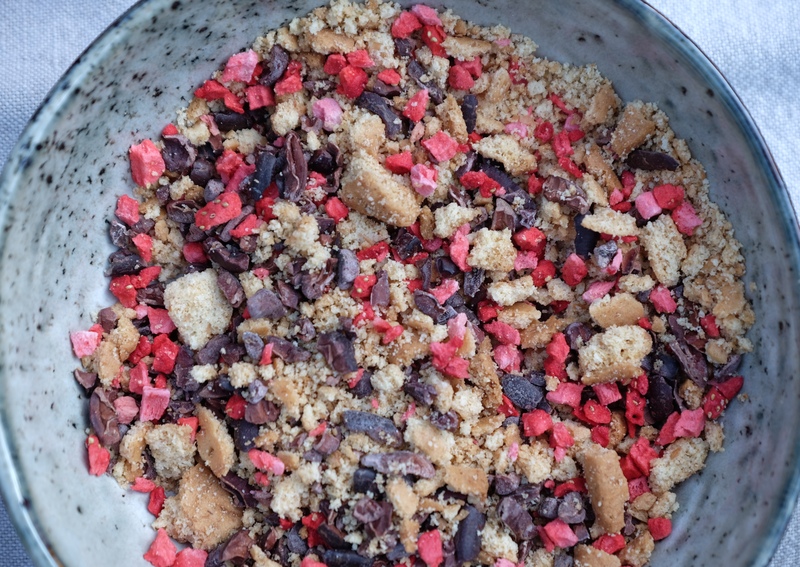 To make the salad, mix all ingredients in a bowl and toss well. 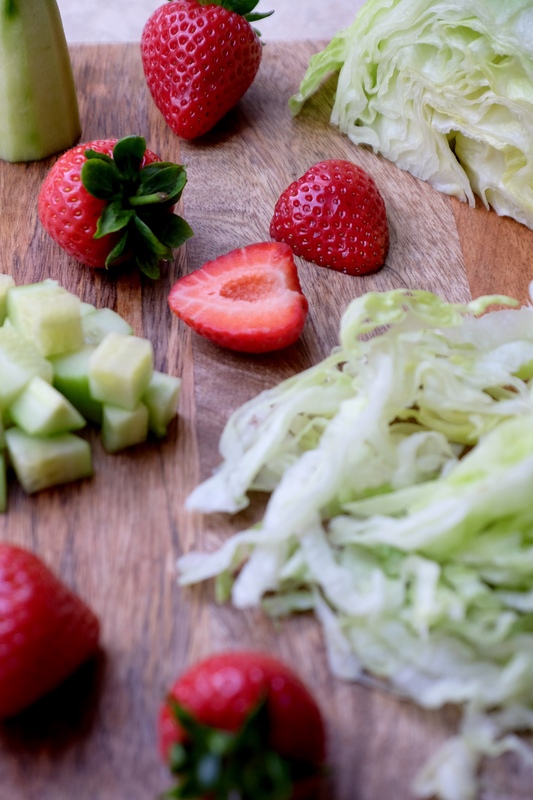 Combine all ingredients for the dressing in a bowl or jam jar and mix well. Pour over the salad and mix. Season with salt and pepper. For the feta cheese, place the eggs, panko and flour on separate deep plates. Toss the feta first in flour, then in the beaten egg and last coat with panko crumbs. You might want to add a second layer of the panko crumbs. Therefore you just toss the cheese in the egg and then in the panko crumbs again. Heat some oil in a frying pan and fry the feta cheese from both sides until golden brown. 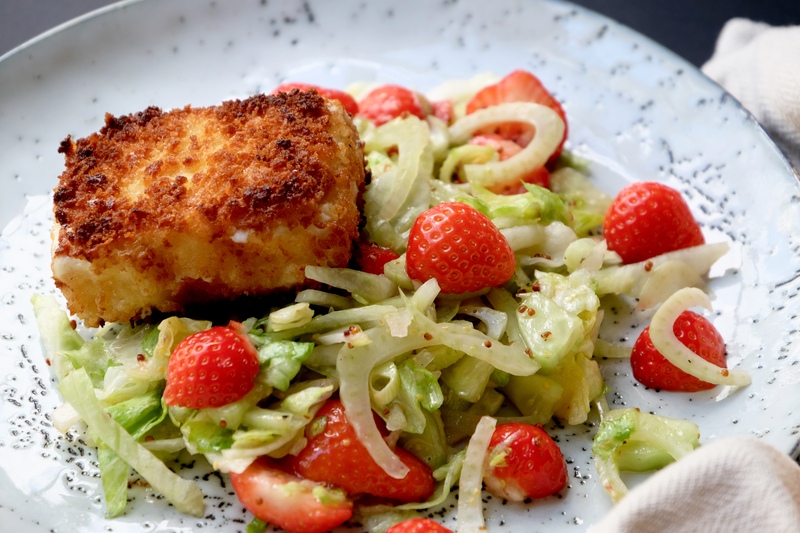 Serve with the summer salad on the side. A couple of years ago I created this dessert, because I had bought a big pack of cocoa nibs. You wonder what are cocoa nibs? They are unprocessed cocoa beans which are broken into pieces. The taste of chocolate but with no sugar and they are crunchy. I had posted a photo of the dessert on facebook, but of course hadn’t written down the recipe. A few days ago facebook kindly reminded me that I had posted that photo in 2011. So I decided to recreate it and share it with you. I hope you will love it as much as I do. Best of all, it is quick and easy to make so perfect for a few guests or even feeding a crowd. 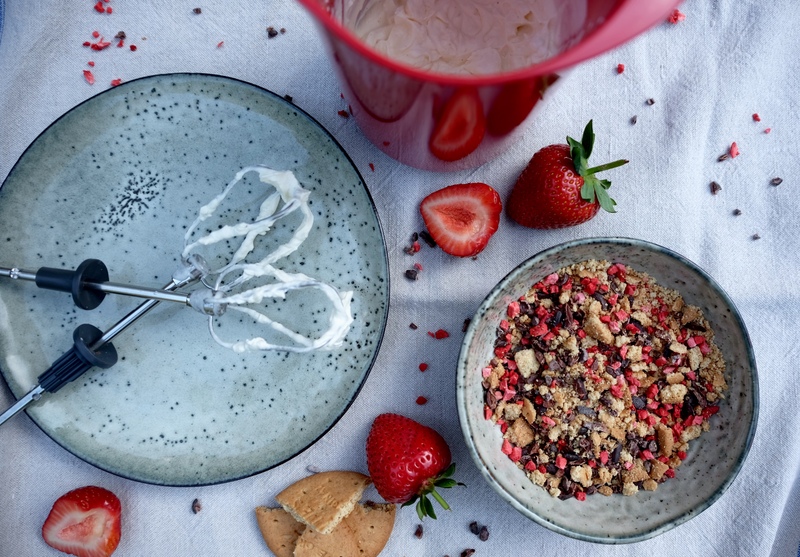 In a bowl mix the crushed digestives, freeze dried strawberries and cocoa nibs. Set aside. Whip the cream with the caster sugar to soft peaks. 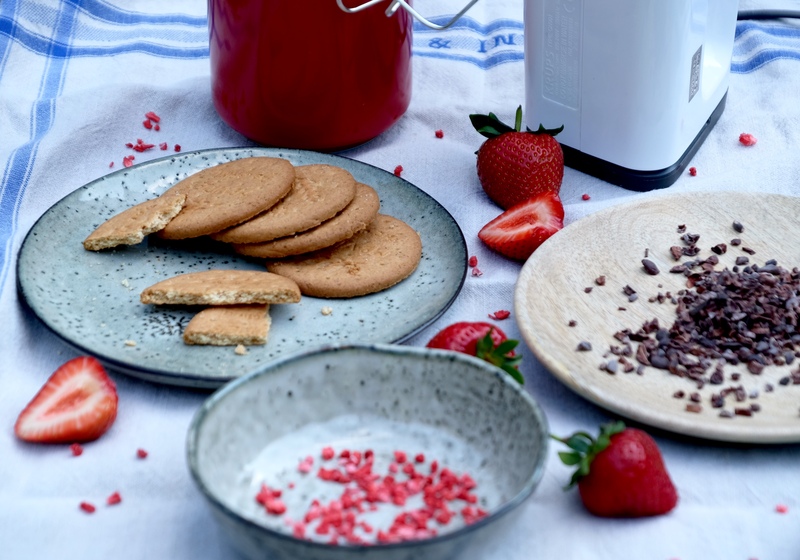 To serve, place a good dollop of cream on a plate, arrange the strawberries around and sprinkle with the digestive mix. Put a few tablespoons of the mixture on the side. Enjoy! This week was Royal Ascot week, and I went with a bunch of ladies on Tuesday. What a fun event! We first had a pot luck lunch at the home of one of the ladies, which was already very nice. Lots of delicious food, a bit of booze and lots of laughter trying on our hats. 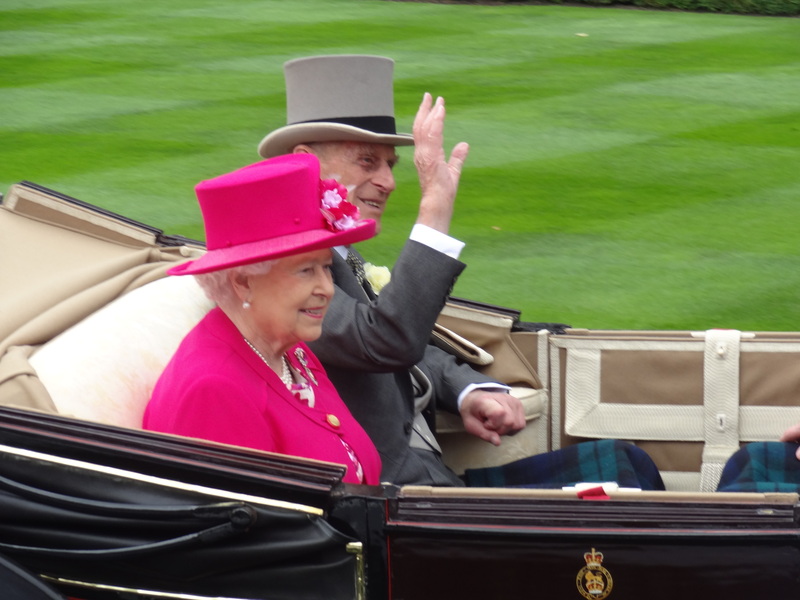 We then went to the venue to wait for the queen to arrive in her open horse carriage. We had a good and close place to see her come in. After that we enjoyed the races, bet on horses, won a bit and lost a bit. It was a great day and lots of interesting people to watch. Once back at home the big question came up: what to cook for dinner. 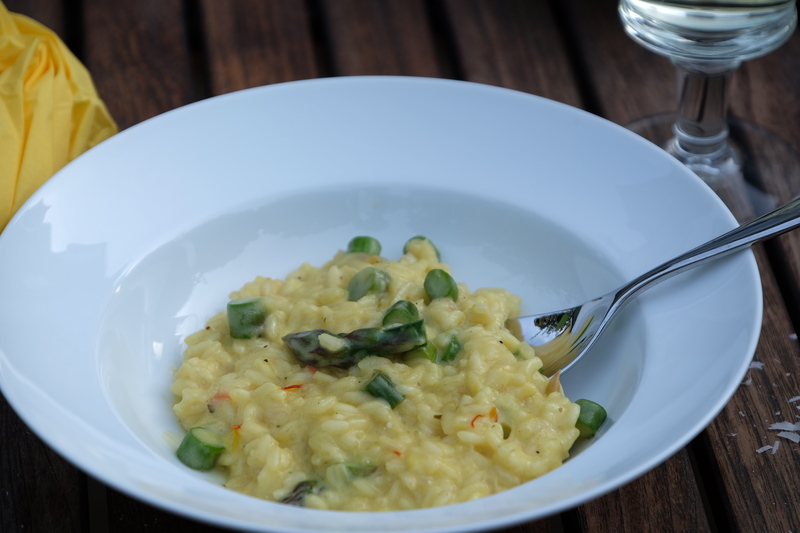 I inspected the fridge and store cupboard and decided risotto with asparagus. I wanted a little twist on that so I took out my jar of saffron- which my son brought back from Spain- and used a good pinch of that. It was one of the best risottos we had. In a heavy saucepan sweat the onions in the olive oil over medium heat without colouring. 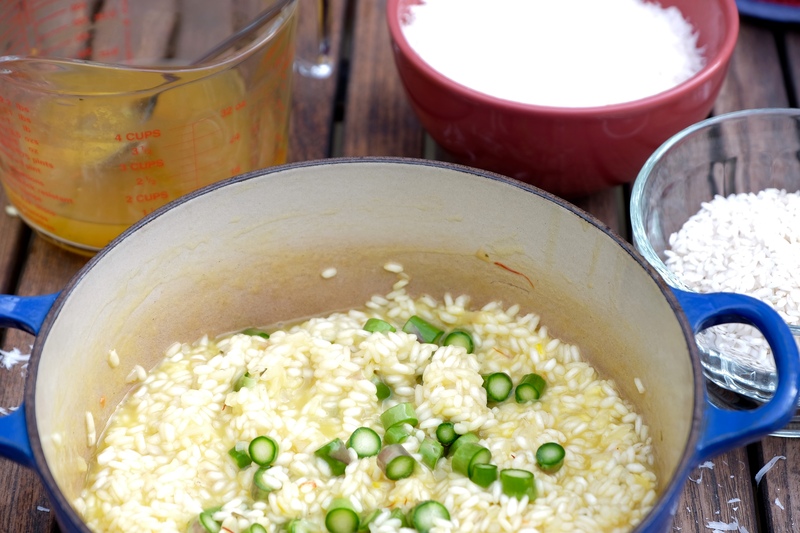 Add the rice and mix well so the rice is fully coated with the oil and fry for 2 minutes. Add the wine and stir until most of the wine has been absorbed. Add the saffron and stir. Now add the vegetable stock one or two ladles at the time, stirring occasionally until all the liquid disappears. Before adding the last 2 ladles of stock, put all the asparagus into the saucepan and mix. Repeat adding the stock until you have used all the stock. This will take about 20-30 minutes. Add the cream cheese and grated parmesan and mix well. Stir until the cream cheese has molten, season to taste. Best enjoyed with a nice glass of white wine! A few weeks ago when we had our first ‘heat wave’ – yes we English call every temperature above 20 degrees a heat wave – Anne, a good friend of mine, was supposed to meet me for a coffee to catch up. She is someone I can count on when it comes to loving my food, regardless what I’m cooking. So here I was in my kitchen thinking about what I could make which would go well with coffee and be super delicious. Strawberries and cheesecake, yes that sounded good, but a bit boring. Then I remembered the bottle of Advocaat I had recently bought because it reminded me of my childhood. When I was little, adults used to drink a glass of Advocaat after their coffee and cake on Sunday. Children were allowed to ‘clean’ the glasses by licking the leftovers. Can you imagine allowing your child to do such a thing these days? I am sure you would get more than just an odd look from others. Anyway, this Advocaat needed to be added into the recipe. I hope you will enjoy this cake as much as we did. I had two slices! Just for those who still wonder what Advocaat is, here a little explanation: Advocaat is originally from The Netherlands, it is a beverage made from eggs, sugar and brandy. It is very similar to eggnog. For the base crush the digestives, melt the butter and mix together. Line the base of a loose bottom tin (20cm) with the mixture pressing the biscuits with a back of a spoon. Leave to cool. Beat the cream cheese with the sugar and vanilla powder. Mix in the whipped cream and then the Advocaat. Spread the mixture evenly over the biscuit base. Put the the fridge for at least 3 hours. Just before serving wash and hull the strawberries. Cut them in half and arrange on top of the cream leaving no spaces. Sprinkle with icing sugar and serve. Today is the day I will post my first recipe on my new blog. I am excited and a bit scared…. Writing is not one of my strong skills, I am a passionate cook, I feel good in the kitchen preparing a dish listening to music (humming the Sibelius Karelia Suite, Op.11 quietly right now while writing, because I was at the Anvil last night listening to the Philharmonia Orchestra and violinist Esther Yoo). You could give me the most complicated task in the kitchen, and I would be confident I could master it but writing and other people reading it is a totally different story. I have decided however, that is what I am going to do – I want to share my recipes with you. So if you don’t enjoy my style of writing, don’t be put off, just scroll down to the recipe and start cooking. The courgette pesto which I am posting today was created a few weeks ago. We eat a lot of pesto and I have tried all sorts of pesto types, basil with almonds, basil with macadamia nuts, tomato pesto, pepper pesto etc… One day I was craving something different and thought I would use courgettes instead. My family was delighted with the result. So for dinner we had pesto and pasta, the day after we had pesto and crackers and the day after that we had crostini with pesto, tomatoes and mozzarella. So lots of possibilities to enjoy. Any feedback is always welcome! Cut the courgettes into pieces, place them into a food processor together with the macadamia nuts and the garlic. Pulse until you have a smooth paste. You might need to add some of the olive oil in order to get a fine puree. Add the rest of the oil, lemon juice and grated parmesan. Pulse again until everything is combined. You might need to scrape down the sides and pulse again. Season with salt and pepper. You can either serve this delicious pesto with pasta, or just as a dip with bread, crackers or raw vegetables.